I'm going to go ahead and assume it's been a while since you were last abducted, had a bloody number spray-painted on your chest, and woke up in a room full of corpses, cryptic clues, and puzzles. If so, here's a game for you to say, "Aaaaah, that takes me back", with GamezHero's 4 Walls escape game about just such a nostalgic pastime. Click (or tap, if you're playing for free on iOS or Android) to interact with or pick up things, and click the big red arrows to navigate around the room. Click on an item in your inventory of the bottom of the screen to highlight it for use the next time you click, or click on another inventory object to try to combine them. (There is a lot of clicking. The madman who kidnapped you, knocked you out, and set you up is very considerate to our dolphin audience. ) Both your keen detective senses and the bodies lying everywhere will clue you into the fact that this is no five-star hotel, so you'll probably want to find a way out as soon as possible. 4 Walls is a short, straight-forward, mostly clever escape game with logical puzzles that rely more on basic observation and math than your ability to MacGuyver things. The atmosphere is fantastic, with eerie sound effects, a discordant musical track, and simple, effective visuals. Don't worry, there are no jump scares or even particularly explicit bits of gore. Unfortunately, if you're playing it in your browser instead of a touch-screen device, you'll probably wish you had a changing cursor to spot interactive zones so you don't have to resort to clicking around. When the end rolls around you'll probably wish the game had more of a story since the scenario really seems to be begging for it, but if what you're craving is a creepy and smartly constructed little escape game to prime your brain for the next time you find yourself locked up with nowhere to go, fire up 4 Walls. And maybe... get that shirt dry-cleaned. 4 Walls Walkthrough now available! You start the game facing the window. Click the curtains to open them. Note the large hole and the shard of glass on the left window pane, as well as the missing handle at the center of the window. Turn right to move to the Table. Inspect the bottom of the left chair. Click the rear left leg of the chair to break it off and add the CHAIR LEG to your inventory. Pick up the BLACK PAPER FRAGMENT 1/3 on the floor beside the right chair leg. Move back to view the full area. Click the man hunched over the table to push him back. Examine the uncovered diary on the table. Click the cover to open it, then note the date written in red on the left page. If you study the right page closely, you can make out some faint white lines. You don't have anything to make them visible yet, so remember to come back later. Go back once and then turn left twice to face the Television. Click the corner of the sofa for a closer look at the whole chair. Lift the right seat to find the SCREWS. Move back and turn left to view the Bed. Pull out the white sheet under the bed two times. Pick up the TAPE that is revealed at the upper right corner of the sheet. Inspect the framed picture on the wall above the bed. Note that each of the triangles in the image points like an arrow towards a specific direction. Memorize the pattern of the four black triangles in the picture. Click the upper right side of the mattress to zoom in. Take the EMPTY REMOTE CONTROL wedged between the side of the bed and the wall. Move back and then left to face the Exit. There are two drawings in this area that depict some fairly straightforward information. Look at the bottom of the left side of the cabinet to find a yellow drawing. The picture indicates that you must insert two batteries into the remote control. Next, look at the bloody drawing beside the handprint at the bottom of the exit door. This image shows that a screwdriver is required to use the two screws. If you take a look at the lower right drawer of the cabinet, you'll see that it has a large hole beside the handle. Use the CHAIR LEG on the hole in the cabinet to pry it open. The PENCIL will be added to your inventory. Examine the baby doll on top of the cabinet. Click the doll's eyes to close them. Note how the number 0 appears on each eye. Click the upper left drawer for a close-up view. The lock on this drawer has four buttons; you can press each button to rotate its image of a triangle. 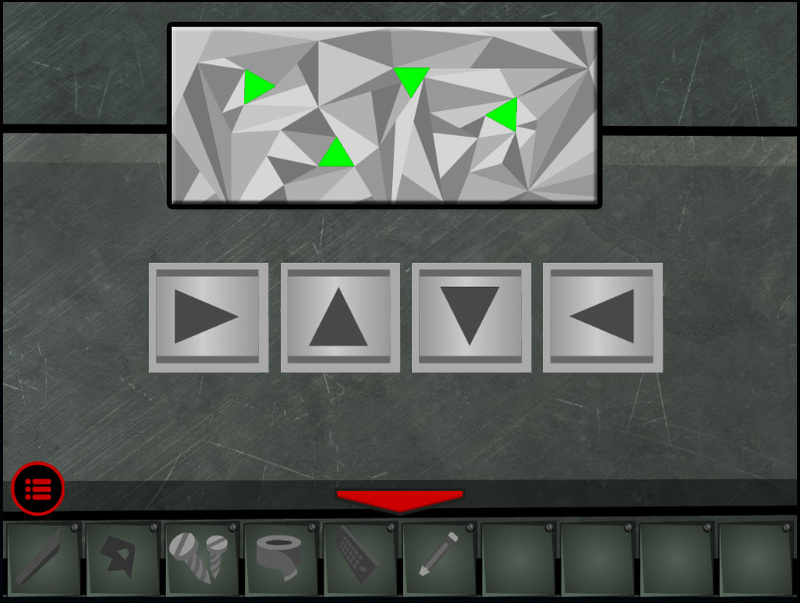 Those triangles should look very familiar! Refer to the picture hanging on the wall above the Bed. Simply recreate the same pattern from the picture by clicking each triangle to point in the correct directions: Right - Up - Down - Left. The drawer will unlock when the correct solution is entered, automatically adding the BATTERIES to your inventory. Select the BATTERIES and the EMPTY REMOTE CONTROL to combine them into the POWERED REMOTE CONTROL. Click the upper right drawer to zoom in. The lock in the center of the drawer requires a six-digit combination. You've seen the correct numbers in order already, now you only need to enter them into the lock. The diary at the Table contains the only clue you need. 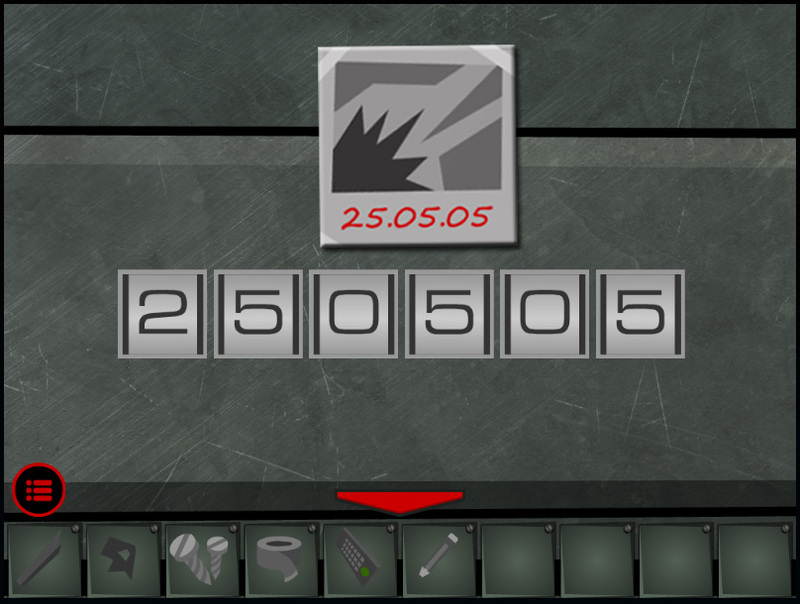 Click the dials to enter the date written at the bottom of the photograph: 25-05-05. The WINDOW HANDLE is placed in your inventory as soon as you open the lock. Select the SCREWS and the WINDOW HANDLE to add them together, making the WINDOW HANDLE WITH SCREWS. Move right twice to return to the Television. Use the POWERED REMOTE CONTROL to turn on the TV. 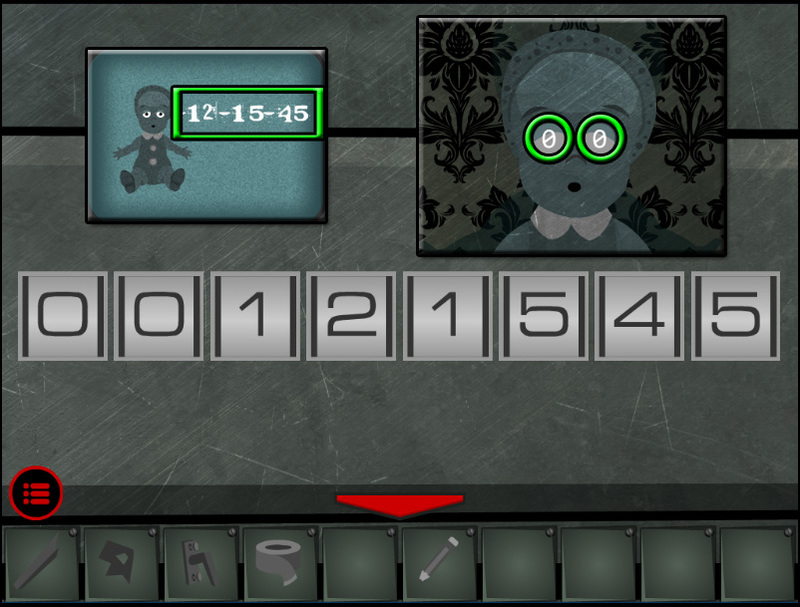 Take note of the image of the doll on the screen and the numbers that appear beside it. Go left twice to face the Exit. Examine the lower left cabinet drawer. Input the correct eight-digit combination to open the lock. Combine the clue from the doll with the image on the television screen. First enter the two numbers found on the doll's eyes: 00. Next put in the six numbers as seen on the TV. Together, the combination is: 0-0-1-2-1-5-4-5. After the drawer is opened, the SCREWDRIVER will be added to your inventory. Use the SCREWDRIVER to open the air vent cover at the top of the wall. You will automatically receive the BLACK PAPER FRAGMENT 2/3. Continue right two more times to move to the Window. Use the CHAIR LEG to remove the large SHARD OF GLASS from the hole in the window. Add the WINDOW HANDLE WITH SCREWS to the empty socket at the center of the window. Tighten the handle with the SCREWDRIVER to open the window. Click the opened window to look outside. Pick up the BLACK PAPER FRAGMENT 3/3 on the left side of the windowsill. Combine all three BLACK PAPER FRAGMENTS in your inventory, then repair them with the roll of TAPE to complete the HOLED PAPER. Back away from the window and turn right to move to the Table. Examine the calendar hanging on the wall. Place the HOLED PAPER over the calendar page. Memorize the three dates not covered by the sheet of paper. The top number is 7, the middle number is 18, and the bottom number is 29. Move back, then inspect the diary on the table. Open the diary and use the PENCIL on the right page to reveal the hidden sketch. Note that the image depicts a key and knife with arrows pointing to the couch. Back up and turn left twice to face the Television. Click the corner of the sofa for a closer look. Lower the back cushion on the left side of the sofa. After finding the secret drawing in the diary, you should see a bulging shape at the upper left side of the chair. Use the SHARD OF GLASS to cut the raised section of the fabric and discover the KEY. Go back and turn left twice again to return to the Exit. Examine the electric lock on the right side of the door. 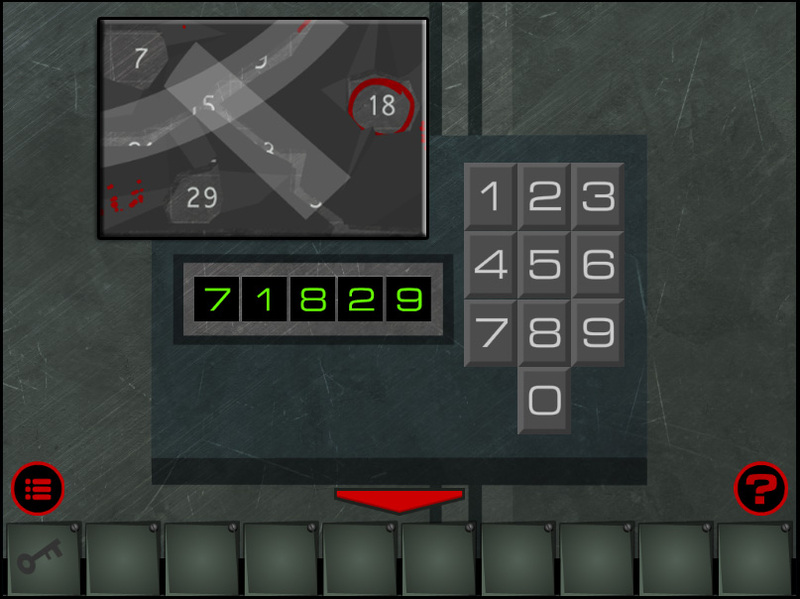 Press the buttons to enter the correct 5-digit combination into the lock. Do you remember the dates on the calendar? Enter the three dates that were not covered by the paper you used on the calendar. Enter the top number first, the middle number next, and the bottom number last. The final combination is 7-1-8-2-9.
key to what I think is the exit door. Am I the only one unable to get this game to load? I've tried in IE, Firefox & Chrome and each time I have a flash crash. Forsooth! 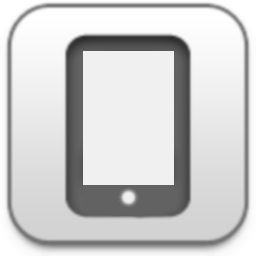 @Kizi2- Not a bad website if you've only just learned webdesign but I think I'll be sticking with JIG. Much more leg room and the seats recline. Am I the only one seeing the entries in the diary in Russian?